I have decided to participate in the Finish 6 by Xmas Tag that has been going around YouTube. If you have not come across this tag, then basically it is a challenge to use up and finish 6 items from your collection before Christmas. The items can be anything... makeup, haircare, skincare, bodycare. 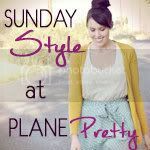 Are you participating in this challenge? Then let me know in the comments below so that we can support and motivate each other! 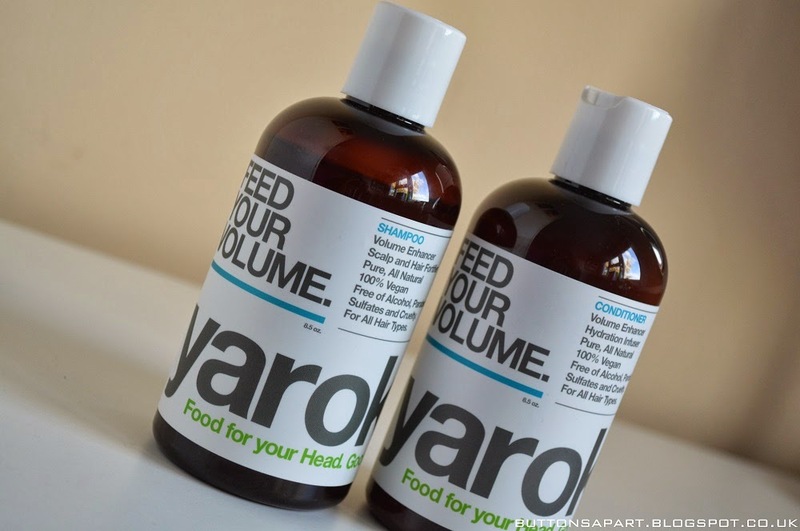 In this post I shall be reviewing the Yarok feed your volume shampoo and conditioner, this is a combinaiton that I have been using solely for almost a year now. I have to say that I do really like these Yarok products. They leave my hair feeling clean, fresh and shiny. My hair feels soft and silky. But not artificially silky, like you get with products containing silicone. Since I have started using this combination I have also had people asking me what shampoo I use because my hair looks really good and smells really nice, so I always take that as a good sign! I love the brand's values, all the products are cruelty free and vegan, as well as being free of alcohol, parabens and sulphates. In addition also donate 3% of their profits to the panchama alliance, a non-profit that works to preserve the amazon rain-forest. The only drawback to these Yarok shampoo and conditioner are that after almost a year of solely using these products I have found that my scalp has gotten somewhat dry and can feel itchy at times. At £19 a bottle they are rather on the steep side, but overall I think worth the money. Shampoo Ingredients: Purified Water, Decyl Glucose and Lauryl Glucose, Coco Protein, Seaweed Extract, Organic Herbal Infusions of Coltsfoot and Marshmallow Root, Calendula Blossoms and Chamomile Flowers, Chickweed, Horsetail, Slippery Elm, Comfrey Root and Sea Buckthorn CO2, Nettles and Oatstraw, Organic and Wildcrafted Essential Oils of Lavender, Atlas Cedar, Red Mandarin, Sweet ORange & Rosemary, Grapefruit Seed Extract. Conditioner Ingredients: Purified water, Vegetable Emulsifying Wax, Organic Herbal Infusions of Coltsfoot, Chickweed, Nettles, Horsetail, Slippery Elm, Marshmallow Root, Comfrey Root, Calendula Blossoms, Chamomile Flowers & Oatstraw, Organic Jojoba Seed Oil, Macadamia Nut Oil, Seaweed Extract, Organic Aloe Vera Gel, Calendula CO2, Organic and Wildcrafted Essential Oils of Sweet Orange, Rosemary & Vetiver, Vitamin C, Sage & Rosemary, Grapefruit Seed Extract, Organic and Wildcrafted Essential Oils of Geranium, Teat Tree, Lavendar, Ravensara Aromatica, Rosemary & Lemon, Sage & Rosemary Antioxidants, Grapefruit Seed Extract. The shampoo and conditioner both come packaged in a plastic bottles. I do feel the packaging appears a bit cheap for what you are paying for the product. However all the packaging is environmentally friendly material which is more important. Yes - in fact I already have repurchased! 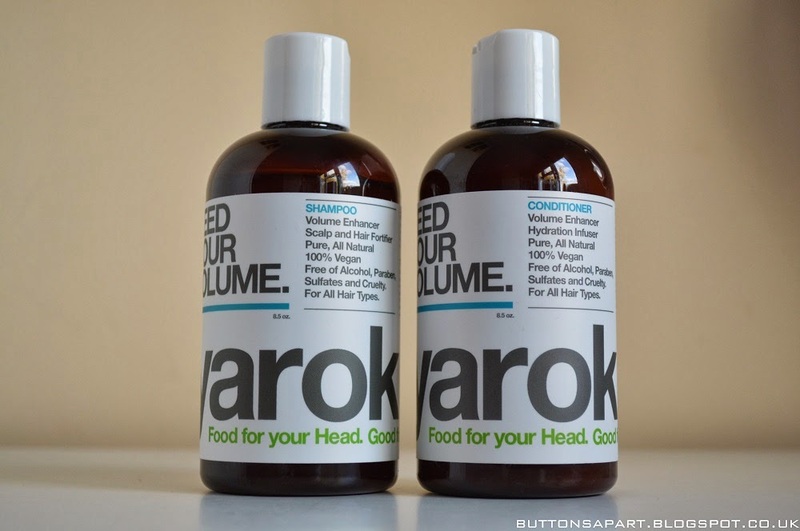 Have you tried this shampoo and conditioner from Yarok? What were your thoughts? Disclaimer: This product was purchased by myself, all views expressed are my own. Product claims are taken from the company website. 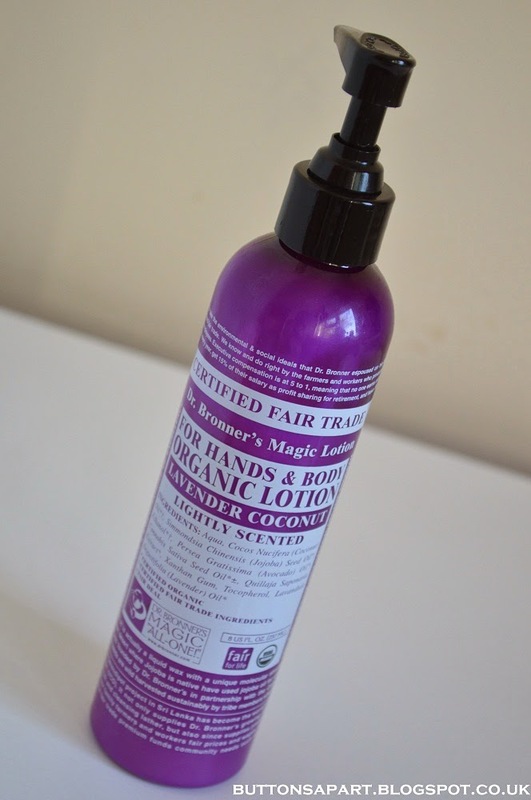 I love that Dr Bronner's is an organic, fair trade and cruelty-free company and hence I was keen to try their products. 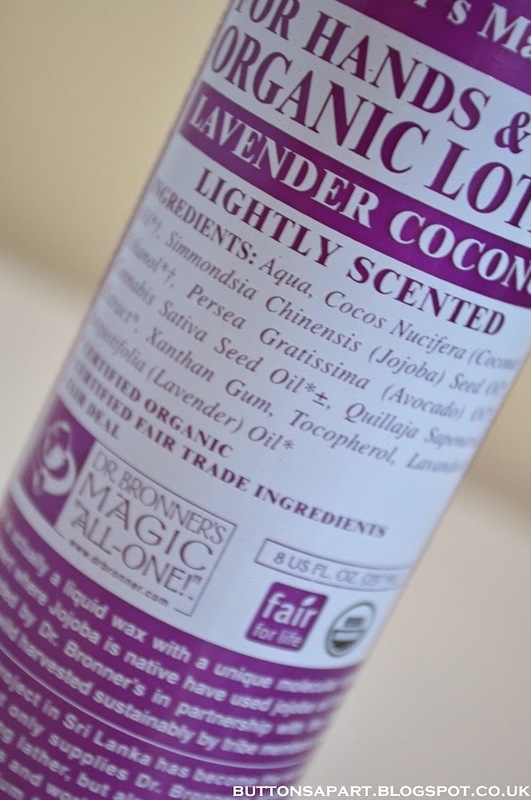 The organic lavender coconut lotion is the first lotion I've tried in their line and i'm writing this review after using up the whole bottle! Certified to National Organic Standards our lotions are based on pure organic oils free of petrochemically modified ingredients and preservatives. 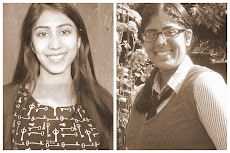 Organic jojoba oil moisturizes dry skin exceptionally well due to its unique similarity to the skin's natural oil. Organic coconut oil assists absorption while organic hemp and avocado oils help keep skin smooth and supple. Organic grain alcohol (ethanol) is used as a natural preservative at a level that helps absorption without being drying. Only the finest organic essential oils are used for fragrance. The lotion is thin and slightly sticky in consistency. It works like a lotion but I suspect because of the mixture of oils does take a little longer to absorb into the skin than a normal lotion, but not as long as an oil. If you use too much then it can be somewhat greasy. Personally during the winter time I don't find the lotion to be as moisturising as I would like, my skin tends to veer towards the dry side and I need something a bit heavier. However I think this lotion would be perfect for the summer. The scent is light and pleasant, it seems to disappear after around half an hour of applying the lotion. Overall I really like the ingredients, the price is reasonable, the packaging is practical and I think this will be my lotion of choice during the summer months. I like that the lotions is packaged in a pump bottle, making it easy and mess free to use! Yes - in fact I already have repurchased this lotion but in the peppermint scent! 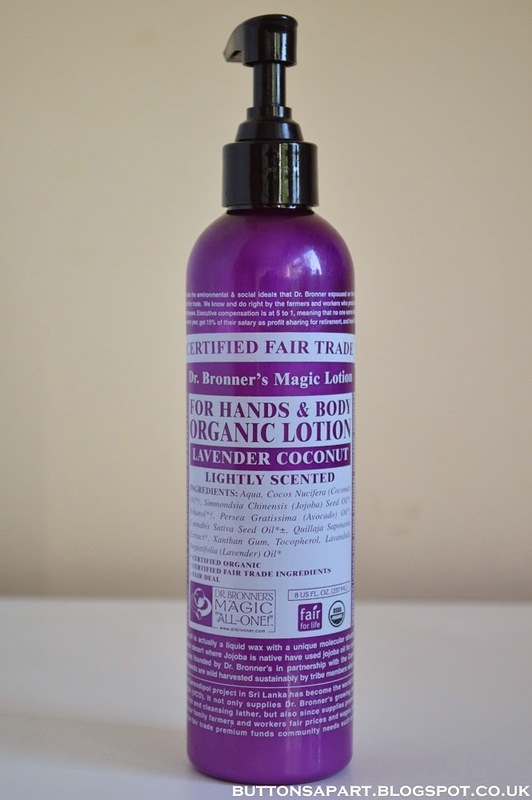 Have you tried any of the Dr Bronner's lotions? Which is your favorite scent?